For the past two weeks, I have been using nothing but shea butter on my skin morning and night aka “My Shea Butter Experiment.” It sounds easy enough, but for a beauty blogger who is used to a ten-step (or more) routine, using only one product takes serious restraint and laser focus. Before I get into the ‘what’, ’how’ and final results of my experiment, I want to explain the why – specifically – why I decided to conduct this experiment. Three weeks ago, nothing was alleviating my dry, inflamed skin. I mean, nothing. Temporary relief was possible with layers of mists and oils, but we’re talking about only an hour or two. Then my skin was back again to feeling tight, itchy and dry, especially around my mouth and chin. We were in beautiful Maui when this skin nightmare began. I presume from testing too many masks days prior and the long dry flight (the humidity on commercial airplanes is around 10% with some being closer to 1%). The oils, mists and lotions I packed weren’t able to provide relief. Nothing I had packed was able to soothe my skin or keep it hydrated. I was desperate. I popped into a Sephora near our hotel and picked up a sample of a petroleum based moisturizer hoping it might help. Again, only temporary relief was found. I knew what was causing this irritated state: A disrupted barrier allowing for trans-epidermal water loss to happen. The frustrating part about all of this was – to heal my barrier I needed to keep my skin hydrated! But nothing was able to create a moisture seal. 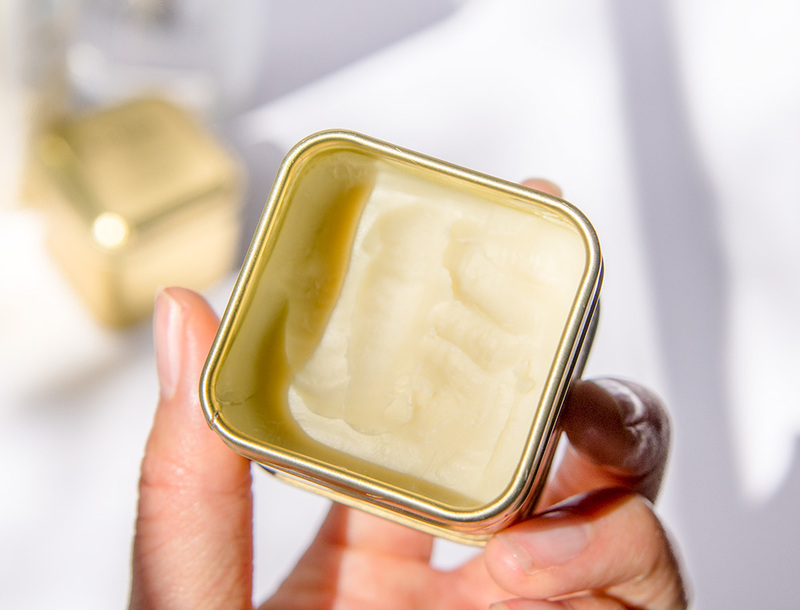 When we finally got home from our trip, I immediately went to my vanity and applied a thick layer of True Moringa’s Universal Cure Balm (one of my Best of 2017 products) knowing the rich butter would help. To my surprise, it helped faster than I expected. I began down a Google black hole reading in-depth scientific studies and reports about each of the ingredients in the balm and when I got to shea butter, I was impressed with what I found. I wondered – what would happen if I just used pure shea butter for two weeks? Shea butter is the fat extracted from the nut of the Africa Shea Nut Tree – Butyrospermum parkii. It has an off-white or ivory color and buttery texture. According to The American Shea Butter Institute buyers should beware of shea butter altered with fragrances or other chemicals which can destroy the natural integrity of the product and in many cases inhibit shea’s natural healing abilities. I won’t go into all the details of the amazing benefits of shea butter because it would take forever and I wouldn’t be able to get to my experiment, but let me highlight the biggies. 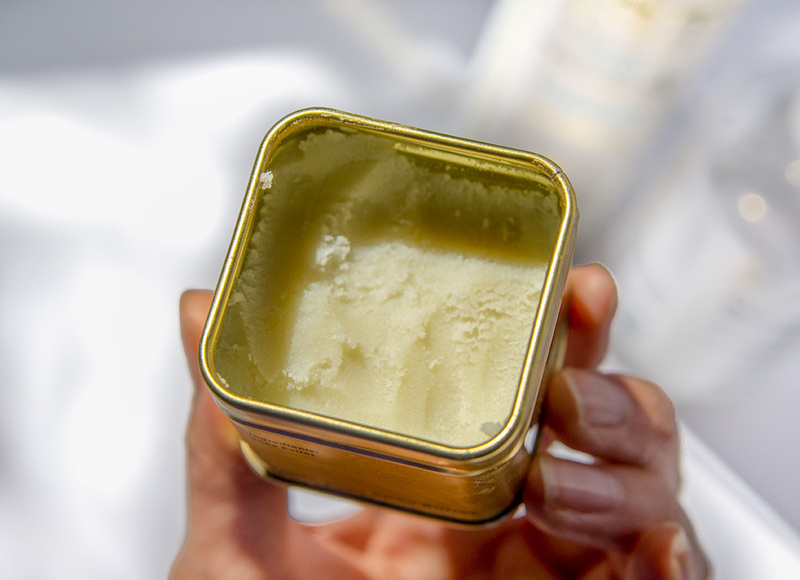 Prevents TEWL: Shea butter has been shown to be superior to mineral oil at preventing trans-epidermal water loss. In a test where participants’ arms were washed with ethanol, it was found that shea butter was able to help the skin totally recover from TEWL within 2 hours. Anti-aging: In another clinical study researching dry, delicate or aging skin, 49 volunteers applied twice a day either 15% or pure Shea Butter and discovered that Shea butter prevented photo-aging, boosted collagen and elastin production. Strengthens skin barrier: Shea butter contains 44% stearic acid, which promotes and protects skin barrier health, and the high oleic acid profile (46%) makes it an effective humectant and emollient holding in moisture. Anti-inflammatory: Shea butter has strong anti-inflammatory effects making it highly recommended by skincare professionals to treat eczema, dermatitis and dry skin. Antioxidants: Shea butter is rich in reparative antioxidants vitamin A (betacarotene), necessary for regeneration in the outer layers of the skin, and vitamin E, capable of repairing and healing damaged tissues. Non-comedogenic: Shea butter has a rating of zero on the comedogenic scale, meaning it does not clog pores. After reading about these amazing benefits and seeing how quickly shea butter soothed my skin, I wanted to see what would happen if I just used shea butter for two weeks. For the first week, I used Eu’Genia 100% Pure Shea Butter and for the second week I used Eu’genia Unscented Shea Butter (shea butter, shea oil, moringa oil, baobab oil). Eu’Genia Unscented Shea Butter (82.5% Shea Butter, 14.5% Shea Oil, 0.5% Moringa Oil, .5% Baobab Oil) – The consistency of this shea butter blend is very dense. I have to use the back of my thumbnail to get the product out of the container. It warms and melts when massaged between my fingers, but when applied it takes more rubbing in than the Pure Shea Butter. I noticed that this oil feels slightly more hydrating because of its thicker consistency. Available here. During both weeks, I used two cleansers: A micellar water to remove my makeup and a gentle foaming cleanser as a second cleanse. 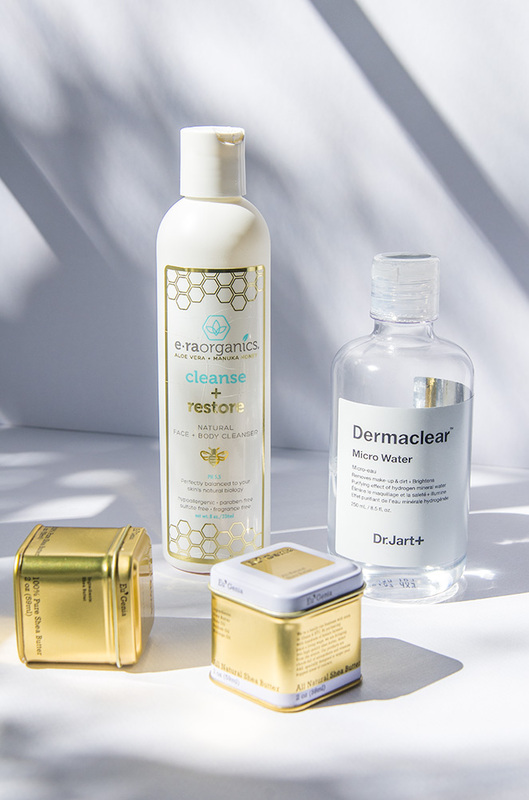 Dr. Jart Dermaclear Micellar Water – I love this micellar water! This one is priced higher than Bioderma, but when you compare the ingredients, it’s no contest; Dr. Jart’s micellar water is hands down a better product. It contains hydrating ingredients (coconut fatty acids, castor oil) that Bioderma does not, and also very small amounts of exfoliants (citric acid AHA, willow bark extract BHA, bergamot oil) that promote cell turnover. Available here. The photo above on the left was taken at the start of this experiment. The photo on the right was taken two weeks later at the end of my Shea Butter Experiment. Both photos were taken in the same spot in my bathroom at roughly the same time of day. PROS: From the photos you can see the redness and inflammation around my nostrils, sides of my mouth and my chin have decreased a lot! My skin looks less red and inflamed overall, and much brighter in the after photo. It also appears smoother whereas in the first photo my skin appears slightly rough texturally; rough texture can be a result of inflammation, not a need to exfoliate. The biggest change was with how my feels. The shea butter was able to lock in moisture alleviating the red, itchy, dry feeling around my mouth. And I could sense my barrier strengthening. Sounds odd, I know, but towards the end of the second week, my skin just looked and felt – thicker and stronger. The thick texture of the shea butter surprisingly provided a nice primer base for my makeup. I was concerned at first it would feel or look heavy, but if you use just a pea sized amount, it doesn’t. Using just shea butter for two weeks gave my skin a very nice breather to restore the barrier, but I could tell my skin would have liked a hyaluronic acid serum thrown in there or perhaps a light scrub. OVERALL: I am very happy with the results! My skin barrier feels thicker, stronger, and less inflamed. But I’m excited to get back to using other serums and oils in addition to shea butter. It’s good to know though that I can turn to shea butter to help repair and soothe my skin the next time I do something stupid and disrupt my barrier, like use two exfoliating masks in one week… #oops #lifeofabeautyblogger. *Want more? Read this interview with Marie Veronique on over-exfoliation, or this article on how to tell if your skin is dry or dehydrated.